Cover any cylindrical container with this FREE Pattern. 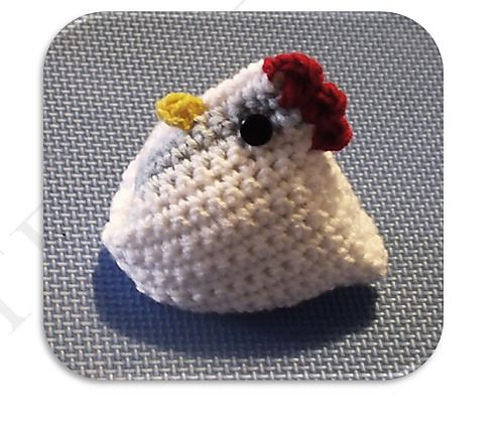 This entry was posted in Crochet, Free Patterns on July 7, 2013 by Thomasina Cummings. 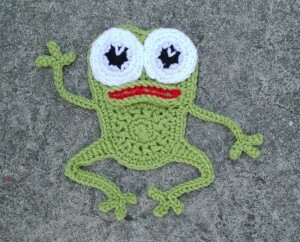 Created just for fun as a dc2tog mini mystery CAL, this little crochet frog is fun and easy to make. You will need approximately 50m of cotton type yarn, an appropriate size hook, a needle for neatening ends, 4 stitch markers and maybe a couple of beads. UK version is on pages 1-4 and US version is on pages 5-8. 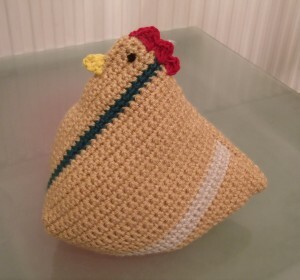 This entry was posted in Crochet, Free Patterns on April 11, 2013 by Thomasina Cummings. 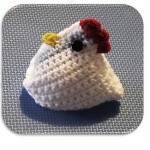 This crochet chicken pattern is available as a free Ravelry download. It was originally put together just for fun at the dc2tog group. It can be made into a stuffed toy, paper-weight or doorstop, depending on your choice of stuffing. Both US and UK versions of the pattern are available for download. You will need oddments of yarn in the same weight (DK, 8-ply, worsted weight or Aran recommended), 2m of yellow yarn (lace-weight, 4ply or DK recommended), hooks appropriate for chosen yarns, two black buttons (optional), a small amount of toy stuffing, weighted filling (optional), a needle for neatening ends. You don’t have to stick to chicken, I think it would make a great seal balancing a ball on its nose, a fish or a monster. You can go as large as you like with the shape itself – think adult beanbag, if you have the patience. Trims will need to be adjusted accordingly. Note If you differ greatly from the given sizes, remember to leave extra yarn for stitching! 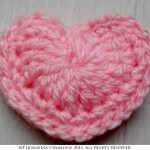 The free pattern this month is for a tiny little crochet heart just begging to be made into something wonderful. What that something wonderful is, is totally up to you! Ideas for uses (from simple to adventurous) might include a necklace, a headband, a potholder, a cushion or a blanket. Crochet Rosebud. Free pattern available here :) Perfect for trimming your crochet. 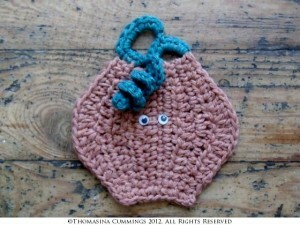 This crochet pumpkin pattern is for a novelty wall hanging. It’s basically ‘a little something’ to use up the leftovers and amuse the children – a little cotton pumpkin hanger with googly eyes. It is written in UK terms with a table of US equivalents provided. Why not make loads and string them up as bunting for Halloween! 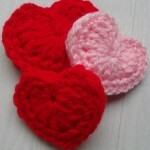 This entry was posted in Crochet, Free Patterns on September 26, 2012 by Thomasina Cummings. 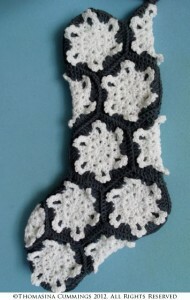 A modern twist on a classic crochet Christmas Stocking design and just perfect to hang from the fireplace. The hexagon and diamond motif have a snowflake centre with raised picot edges giving a slightly 3D appearance. You will need up to 200m each of main colour (MC) and contrasting colour (CC), an appropriately sized crochet hook and a needle for neatening ends. MC and CC are used throughout to indicate how the example was worked. You may, however, substitute different colours, as desired, to produce a variety of different effects. The example was worked in Patons Smoothie DK in White (MC), Patons Smoothie DK in grey (CC). Each hexagon measures approximately 4” (10cm) across the widest part and the final stocking measures approximately 16” (41cm) vertical drop length. 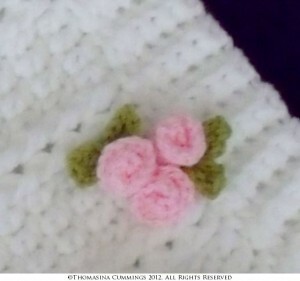 This entry was posted in Crochet, Free Patterns on September 12, 2012 by Thomasina Cummings. Turn your baby into a gorgeous little flower for a photo shoot. This oh-so-sweet flower hat is generously sized to fit a whole range of babies from 0-3 months. Materials: Approximately 75g of double knit (8 ply) main colour and 25g of double knit (8ply) contrast colour. Tools: 3.50mm (E) hook and a wool needle for finishing. Gauge: 4 stitches and 3 rows = 2.5cm/1” (trebles). Pattern written in UK terms with US equivalents provided where applicable. 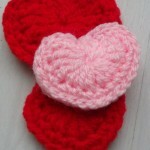 This entry was posted in Crochet, Free Patterns on August 21, 2012 by Thomasina Cummings. In these days of environmental consciousness, we’re all striving to use less plastic bags and more re-usable bags. 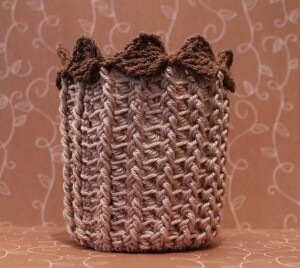 This crochet bag is shown here in its small size but, size is fully customisable. Why not make it out of strong cotton and make it your go-to handy shopper. 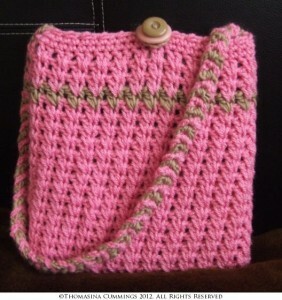 This pattern will enable you to produce a crochet bag to suit any purpose. Size (height and width) are fully customisable from handbag to Christmas Gift Sack. Use a sparkly silk yarn to make an evening bag in a handbag size or, maybe, a cotton linen mix yarn to make a handy bag for shopping. Materials: Any type of yarn with appropriate sized hook. For reference, a handbag uses around 75g (225m) of DK (8-ply). Optional: Button sized to fit through fastener (size varies with yarn). Perfect for when you need a crochet hat in a hurry as a baby shower gift, last minute matching accessory or to take to the hospital as a quick present. 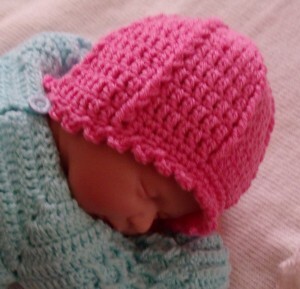 Simple newborn crochet hat which can be worked very quickly. Clever shaping covers little ears without the need for separate earflaps. Shaping is disguised by the subtle use of stitches worked in spaces instead of into the top of the stitch as you normally would. Suitable for beginners -diagrams included to clarify stitches/methods. Uses approx 50g/110 yards of yarn (double knit/8ply) and a 3.50mm hook. Would work for a baby boy or girl. Could easily be jazzed up with flowers, embellishments, ribbons, buttons or bows. Shown here with optional girly picot edging. 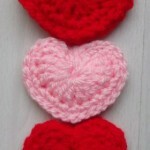 This entry was posted in Crochet, Free Patterns on August 19, 2012 by Thomasina Cummings.